There are so many products out there to help you work your pup’s brain and help them eat more slowly – and I might have just about every variety for my two beasts. However, I’ve been lucky enough to get these second-hand and at a discount. Since I’m not currently in the business of selling pet products, I’m going to share some do-it-yourself secrets to make food puzzles at home – super cheap! 1. Muffin Tin – So easy! – Turn a muffin tin upside down and spread kibble between the bumps. Your dog will have to nudge the food around from all different angles. One thing I love about this is that the top of the tin is flat, so they can’t just flip it over. 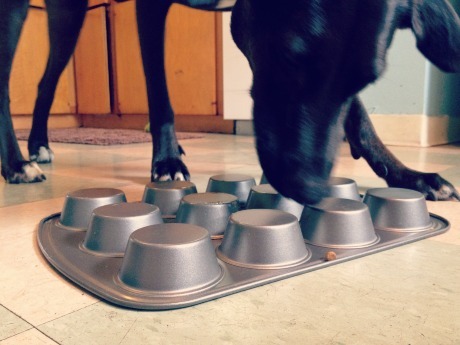 This is good for larger dogs, but for smaller pooches try a mini muffin tin. – Keep the tin upright and divide the kibble up between the cups. 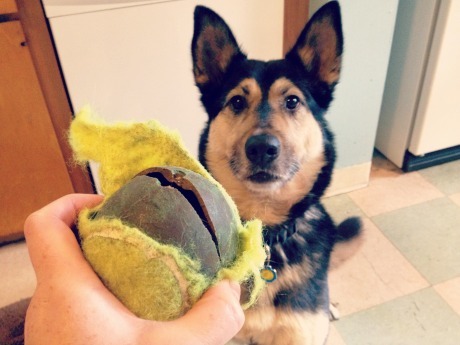 Add difficulty by covering each section with a tennis ball or other toy. Those worn out old tennis balls can be turned into puzzles. Just cut an X into the ball or cut along the seam to make a flap. Stuff some kibble inside and let them go for it! Just make sure the ball stays large enough that your dog can’t swallow it. For the more rambunctious canines, cut the piping to about 12 inches, drill some random holes (large enough for your kibble), put end pieces on both ends, and you’re done! Your pup has to nose it around to get the kibble to fall out. This is great for dogs that don’t destroy and consume plastic. Simply cut a few holes in various places in the plastic and fill with kibble. Many dogs just like to crunch plastic bottles and milk jugs too. Easy and recyclable! Surf loves to shred cardboard boxes, especially the ones that cereal and snacks come in. He never eats the pieces, so I let him have it and it seems to be a wonderful de-stress activity for him. Simply put kibble in the box and close it. Add difficulty by putting boxes inside boxes (like those nesting dolls), with kibble in between each layer. Another way to make use of your recycling! For the laziest of us! Simply spread kibble out under a towel on the floor. Let your dog sniff out and find all the pieces. Remember that no toy is indestructible so always supervise your dog if you think there’s any way they could chew off a piece of any toy and swallow it. Check out more tips from Julia for more ways to keep your pup busy! How do you keep your dog from getting bored on the cheap? What benefits do you see in your dog when they’re asked to work for their food? When’s your favorite time of the day to use a puzzle toy with your dog? Lynda manages our dog walking team at Rover-Time. Her career focus is on dog training and behavior and her approach is based on science, positive reinforcement, and humane methods to improve relationships between humans and their pets. She’s also an assistant trainer at Animal Sense in the evenings and co-parents her own cat and two dogs, Surf and Ryan, with her other half Mary. These are great! My dog needs some entertainment with his meals or else they last 5 seconds. Thanks for sharing! These are great tips, Lynda! Thanks! Can't wait to try them out! Genius! Thank you for posting. What Do Dogs Think About Canine Flu? I make frozen treats for them. I use yogart, baby food bananas and peanut butter. Mix it together and put it in 5 oz plastic cups. I stand up a chicken jerry strip in the center and freeze. They love it in the summer. It occupies them for a while! But needs to be given outside of course! Thank you! I now can 'dress up' quite a few of these ideas, wrap up each one - and tadah! It's happy holidays for Rosco, my son and his gf's Siberian Husky! Have to make some modifications cause he IS one of those dogs that never met a plastic bin he didn't like ... to chew into a million pieces! Forget the kibble, he'll take his plastic! :-) The others? Better than storebought! I plan on making him home-made chew bones too - more flavorful, more healthy and ok, maybe a bit more messy but they have a broom! My Chihuahua gets every box from the kitchen from a little butter box to a long 12 pack box. He tears it up for me then it fits nicely into the trash can. I just pick up after him when he is done. He enjoys this job especially when I am cooking that is when he does it fast. I just hand him the empty boxes and he is so willing to accept the responsibility. He is not allowed to eat it and he doesn't. These ideas sound like the life savers I am desperately needing! As a new mom of an Aussie, desperation is palpable in my house! I would also appreciate hearing about 'chewable', other than shoes! I hide kibble inside a sock that I have balled up. Or fold it inside of towels. I also have a stick that has a string tied to a sock. He is obsessed with chasing the sock. He also loves to chase a big ball around the yard with his nose. He is a corgi so anything that moves or involves food makes him happy. My dogs get so excited going to the park to play ball, and they never know when we are going to start to play. They stay close to me because I won't throw the ball if they have gone ahead, so it's fun watching them want to run ahead but they know they can't. There is a crossing between two pathways which is slightly out of sight, and we need to watch for cyclists, so I have trained them to walk SO SLOWLY up to the crossing, sit and wait until I have crossed and then I call them and we usually start playing the ball throw game by then. It's great having them control their excitement but then see them all happy when the game starts. They know it's all been worth it. They are a huntawayXcollie (NZ sheep dog) and a collie X pointer. Both from the shelter. Originally when I read tennis balls and a muffin tin I thought you meant hiding snacks in the muffin tin cups with tennis balls on top of them, encourage the dog to look under them for treats! These are great ideas, thank you! I like being able to use simple things around the house without buying fancy toys for my dog who would totally play with anything I give him. These are great ideas! Thank you sharing them!